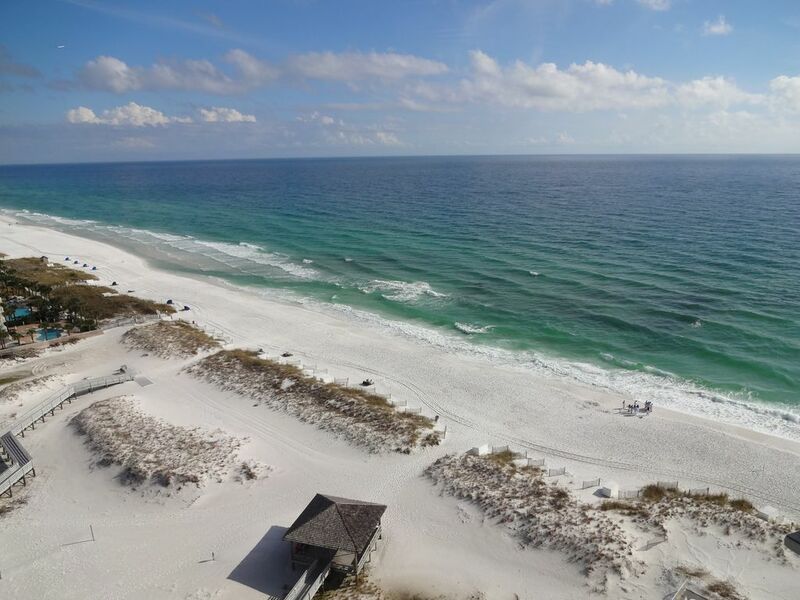 Located directly on the beach at the very popular Pelican Beach Resort right in the heart of beautiful Destin. This non-smoking two bedroom/two bathroom condo was beautifully renovated in late 2011 with a brand new kitchen and with high quality new furniture added throughout including a big 42" diagonal Flat Screen TV with a DVD player! The condo has a highspeed wireless internet connection so you can surf the internet while sitting on the balcony watching the beautiful Gulf of Mexico shine!Both the master and guest bedrooms are also fitted with flat panel TV's with built in DVD players. Our condo is beautifully decorated and very well maintained so you can be sure of a very comfortable vacation stay! This unit is located on the 19th floor and comes complete with an absolutely stunning view of the beach and lagoon style pool from the full length balcony and of the Destin Harbor from the front door! This upscale resort is ideally suited to families with a beautiful lagoon pool, kids pool, gulf front hot tub and an additional indoor/outdoor pool. The property also boasts; beach service, huge sunning deck, exercise room, steam room, sauna, convenience store, delicatessen and a beachside bar. The property is close to many excellent restaurants via either a short walk or short drive, local attractions such as theme parks, mini golf and go-carts. The shopping is beyond belief with the USA's largest designer outlet mall only ten minutes away with other major shopping areas even closer. This is truly a family destination resort with more than enough activities available to keep everyone entertained for a week or more. The Destin weather and the powdered sugar like sand will make for an excellent vacation experience! *** Please note that I own a second and identical unit at this resort on the 4th floor on VRBO#260317 which has additional photos. This information may be helpful to you in deciding to book either condo for your vacation!! High Speed DSL Internet Connection, Pools (shared), Gas Grill BBQ (shared), Non Smoking!! We’ve been coming to the Ft Walton/Destin area for over 20 years to vacation with our family. We have even invited friends to join us and they love it as much as we do. This is our 2nd time staying at Pelican Beach Resort, and this unit did not disappoint. The views from both the large balcony accessible from the LR & MBR and from the guest room window are truly breathtaking. The sugary white sands, the crystal clear ocean, views of the city and the lagoon & Destin bridge are magical. And who can’t get enough of the soothing sounds of the waves. We were even lucky enough to sight about 20 dolphins that were coming close to shore. The condo itself is nicely decorated & has plenty of space to accommodate our family of 6. We had a slight hiccup with an issue inside the unit and the owner was timely in communicating with us to try and resolve it. I am fully confident that it will be addressed. It was also great to have a washer/dryer inside the unit for all our laundry needs. Our kids also loved all the onsite amenities that the property offers; café, 2 pools, hot tub, tiki bar, etc. Unfortunately the gym, sauna & steam room were closed which was disappointing. They also are old enough now to take advantage of this property’s proximity to a myriad of fun activities, shops and restaurants in the area that they could walk to daily when tired of being at the beach or pool. The only inconveniences of the property are that the hot tub is a bit small for the total number of guests; we often would have to wait or come back to use it. It holds maybe 6-8 ppl max. And the whole beach chair/umbrella service that dominates the space & views of the entire front rows of the beach is kind of ridiculous. It wasn’t a big deal for us as our children are now old enough that we don’t need to keep a close eye on them, but this could be a problem for families with young children who don’t want to spend $35 a day to have to rent them to be closer to the water. All in all, it was another great vacation in a great upper floor unit and we plan to come back! The property and condo is just as its portrayed in the listing - BEAUTIFUL! This was our family's first Spring Break trip and my children's first time visiting the beach. Although the weather wasn't exactly what we anticipated, there is plenty to do in Destin and having a very well heated outdoor pool on the property was a great benefit. Watching our own little dolphin show from the deck of the condo each morning and evening was a highlight for all of us. While we were very sad to depart and head for home, we know we will be back, and highly recommend this unit/property to anyone looking. The property was perfect for our family of four. It was a good layout and had everything we needed, and was quiet and comfortable. And of course, the location was stunning. It was also really useful to have the grocery store and a Target across the road. Highly recommended! We loved it, from the moment we got there and the friendly staff we knew we chose the right resort, the room was outstanding, unlike anything we had stayed in before, and the view of the ocean from the 19th floor and the sunrise was breathtaking, already looking forward to our next visit. Amazing location! Perfect for my family!! This unit is exactly what we were looking for! The view is spectacular. The location is amazing! The unit is very clean. The owner is incredibly responsive which I really appreciate! Can't wait to stay again!!! !